As millions of men and women around the world, I watched the first Bush vs. Kerry debate at the TV two nights ago. Of course, I would not dare to command, dear American friends, where should go your vote. But some of you think, with some reason, that the United States of America are leading the world. If so, every human being on this tiny blue planet will have to live with the results of this election for the better or for the worse. So it is important for you to know how foreigners like me feel about the tremendously important decision that you are about to make. I am a French citizen in his mid forty peacefully living in Montreal, Canada, since 1989. At that time I chose to land as an immigrant in the Province of Quebec because I admired your civilization and your way of life, but I was naturally seduced by the possibility to live, love and work in French, my mother language. After fifteen years here, I feel twice more Canadian than French, and twice more North American than European. I have several beloved friends in the US, particularly in the regions of New York and Boston. In fact, I am a very close « ami » of your people. I share most of your culture, values and dreams. 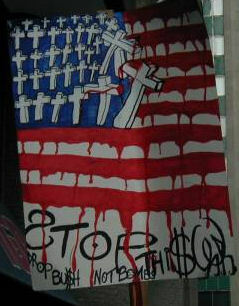 I feel your pain in my flesh when horrible disasters such as 9/11 or those latest devastating storms fall on you. I stand by your side — but not at any price, hopefully. Since November 2002, when the Bush administration began talking about invading Iraq, I knew (and I publicized it on the Internet) that it was a very, very bad move. Irak was not one of those poor Central American countries where you can ship a bunch of CIA agents, a load of heavy equipment and a battalion of well-trained troops in order to throw down a helpless, although legitimately elected socialist government. It is a large and harsh country inhabited by a very tough people who has been trained to make war (not love) almost every decade for centuries. As many Western countries’ citizens and governments told you repeatedly, I knew that it would result in a horrible and bloody mess. Unfortunately, your political leaders of the time refused to consider what almost the whole world — except a bunch of low-profile subordinates pompously called « International Coalition » — shouted loud and clear. Two years later, you cannot close your eyes and reject the evidence again. No matter how sincere and determinate you were in those times of hurt, pain and anger. It appears clearly now that the Bush administration is not in control of the war it has started and that this war does less hurt terrorism than it boosts it by sowing millions of seeds of humiliation, hate, and anger in young Arabic souls. This in an infernal circle that our grand-children may have to live with. Twelve thousands Iraqis have died so far — not mentioning the 1,052 Americans who joined them in grave. What do you think will result from that shattered lives? There is about no evidence that the American-Iraqi slaughter will end in the near future. In the meantime, Afghanistan is left aside of the civilized world with short American help, partly dominated again by warlords and radical Islamic rebels. Mister Ussama Bin Laden is still running at large, and Middle-Eastern Arabs would laugh out loud if they were not busy hating your spangled banner a little more everyday. To my sympathetic foreigner’s eyes, this apocalyptic and counter-productive situation is a great proof of political failure. Fortunately, time calls for a new presidential election. I watched the two candidates on my TV last Monday and I was stunned by the difference between the two both in style and content. Bush looks like a middle class, stubborn suburban salesman talking about live, death and war as he would talk about cars, golf clubs and cigars. 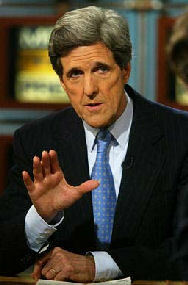 On the other side, Kerry looks like a distinctive leader full of spirit, wisdom and strength. The way that Bush is leaning on the same few primary messages again and again, with the same words learned by heart as magic formulas, does much contrast with the sharpness and complexity of Kerry’s inspired speech. Of course, you don’t have to buy every of Kerry’s words in order to elect him as the next President of the United States. He is not God came down to Earth. As a human being, he has strengths and weaknesses. But he also has enough intelligence to listen and weight carefully every decision he may take. He looks responsible and sizeable. He is the only one, in fact, that has a chance to really protect America against new acts of Islamic terrorism for the years to come. Seen from 400 miles away, he is with absolutely no doubt your best bet in order to clean up the humanitarian and economical mess created by the Bush administration, to restore US’ credibility in the world, and to lead your usually peaceful and democratic people to a new cycle of prosperity and deserved glory. During the last four years, the little self-satisfied man that you have elected as President in 2000 has not shown his vision nor his strength. On the contrary, he has proven his spiritual blindness, his political stubbornness and his dramatic failure. I can certainly admit that you, a great people with great values and a great history, can make such a big mistake once. No people is elected to be perfect, whether in America, in the Middle East or anywhere else on Earth. But I sincerely cannot believe that you would do such a big mistake twice. That would be so disappointing. Come on, guys. The stakes are too high. The timing is too tight. The world needs a great President of the United States right now — a man that stands above the crowd, that leads and truly protects his people, that deals with tact and effective results with the rest of the world. Your great country does not deserve a second presidential term of short vision, ugly mistakes, poor thinking, shaky economics and massive destruction. We all need an America at work, an America in control, an America opened for business and building peace — not a lost America destroying what is left of her dreams. Well, folks, this is your decision — not ours. So please think about it twice.